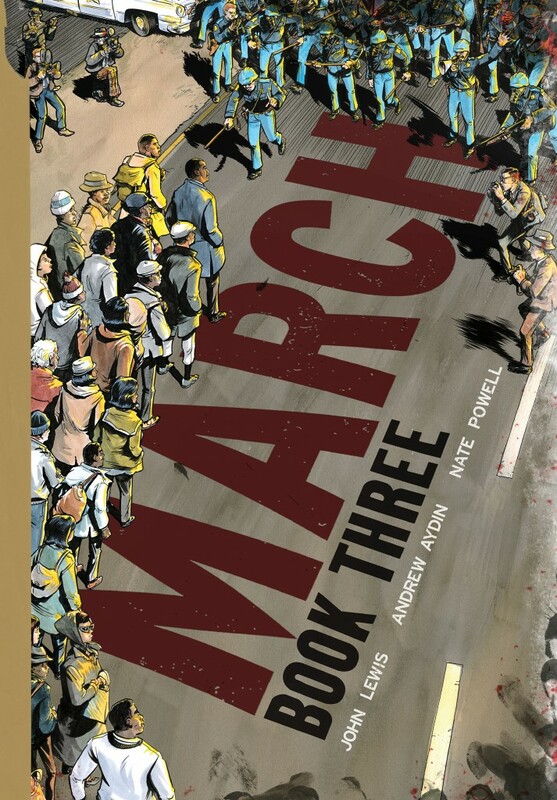 In this post we take a closer look at March: Book Three by John Lewis, Andrew Aydin, and Nate Powell (Top Shelf, 2016).March: Book Three brilliantly and sensitively concludes Representative John Lewis’ story while documenting Americans’ struggle for equal rights and civil liberties. Through all three volumes of March, readers read, see, and feel those struggles first hand. Furthermore, while each part of the trilogy tells a continuing story, that they each can equally stand on their own as solid stories and historical resources. Alone and together, these three volumes relay the struggles, the pains, and the hopes of Black and White Americans in the early 1960s, while highlighting some of this country’s greatest modern heroes. 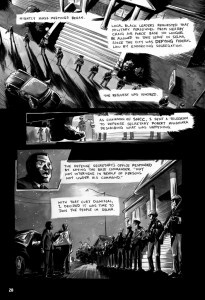 March: Book Three is the final volume of Rep. John Lewis’s graphic novel memoir trilogy, co-written with his aide Andrew Aydin and illustrated by Nate Powell. Since its publication, the book has won numerous awards. March: Book Three won the Coretta Scott King Book award recognizing an African-American author and illustrator of outstanding books for children and young adults; the Michael L. Printz Award for excellence in literature written for young adults; the Robert F. Sibert Informational Book Award for the most distinguished informational book for children; and the YALSA Award for excellence in nonfiction for young adults. March: Book Three also won the National Book Award — the first time a graphic novel took this coveted award (although others have been shortlisted, including Gene Luen Yang’s American Born Chinese and Boxers and Saints, David Small’s Stitches, and Noelle Stevenson’s Nimona). The book is also a #1 New York Times bestseller, winner of the Walter Dean Myers Award for Outstanding Children’s Literature (Young Adult Category), finalist for the LA Times Book Prize, and an Eisner Award winner. Finally, it received starred reviews from Kirkus Reviews, Booklist, School Library Journal, The Horn Book, Library Journal, and Publishers Weekly. In addition to these prestigious awards and recognition, March has been adopted into core curricula across the country. March is now used in San Francisco schools and in New York City schools, where it is read by all 8 graders as part of their American history curriculum. Atlanta schools are now using it in their seventh-grade language arts courses. Please visit our previous posts detailing instructional guidance March: Book One and March: Book Two. March: Book Three opens with the bombing of the 16th Street Baptist Church at the hands of the Ku Klux Klan, which claimed the lives of four young girls. As the book unfolds, we read about Lewis’ involvement in Bloody Sunday as well as his public work and private experiences leading up to The 1965 Voting Rights Act, which closes the book (aside from an epilogue depicting President Obama’s inauguration in 2009 and mirroring the opening of the trilogy). 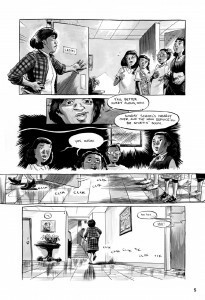 The storytelling and its emotionally packed panels make this volume and the entire series essential reading for middle school students and up as they learn understand this critical and tumultuous time in American history. March: Book Three, begins with the September 1963 bombing of the 16th Street Baptist Church (and the subsequent riots) and ends with the 1965 Voting Rights Act being signed into legislature. 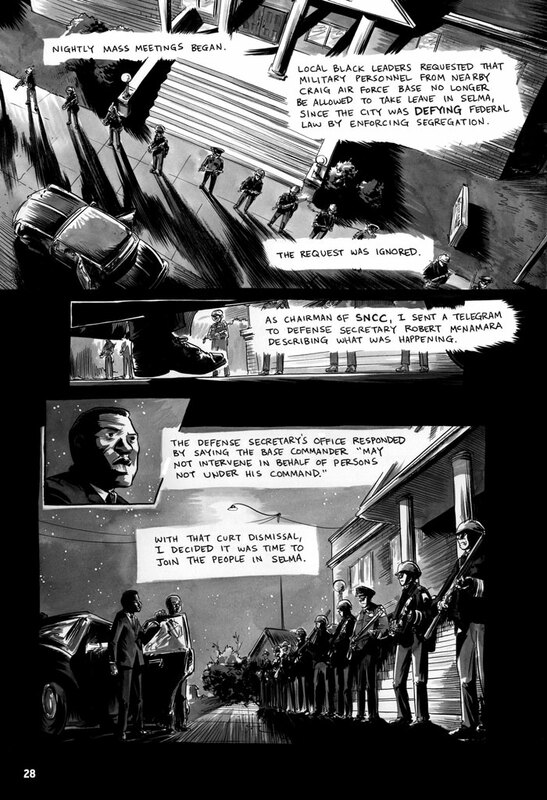 Throughout Book Three we learn about the Civil Rights Movement from 1963-1965 and John Lewis’ role in it as chair of the SNCC (Student Nonviolent Coordinating Committee), as a speaker, and as an activist in various marches and innovative projects such as the Freedom Vote, the Mississippi Freedom Summer, the Democratic National Convention and more. In short, Book Three is about the SNCC’s efforts to register African-American citizens to vote. While we today often take this patriotic act for granted, the creators relate just how challenging it was, and how many Americans gave their time and even their lives to secure this right. In this volume, Lewis relates what he believed to be the critical turning point in the Civil Rights Movement and why the SNCC eventually fractured. 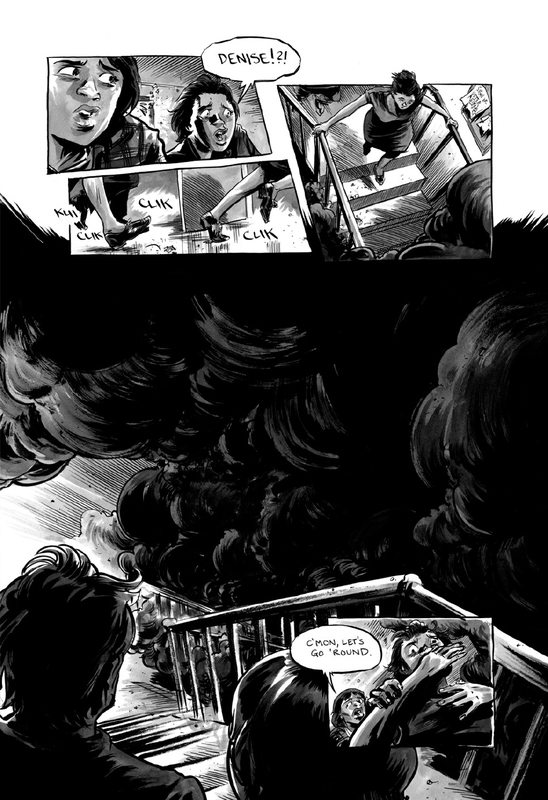 March: Book Three is beautifully written and illustrated. As in the previous two volumes, we read, see and feel, the tension in the South and in Washington as events unfold. The interplay of language, art and design (choice of panel, font and use of space) make the story come alive. We, as readers, literally feel like we are there, observing, hurting, feeling, and cheering on our heroes. Through the use of visual and verbal metaphor, narrative, dialogue, snippets from famous quotes and speeches, the story feels real, personal, and meaningful as these three authors make this tumultuous period in our history come alive. In March: Book Three (as in the previous volumes) black and white images empower viewers to comprehend those volatile times as we intimately view Lewis’ recollection of unfolding events. 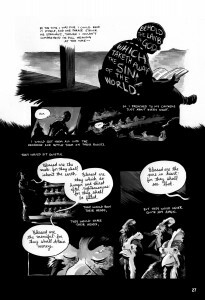 Powell’s black and white contrasting, sharp angles, and brilliant page design and fonts are all used to relay violent emotions. This is then paired and contrasted with soft, sloping grays for the gentler intervals. We see Black and White protesters treated with equal respect and drawn with soft rounded strokes, while White Southern agitators and Ku Klux Klan members are drown in chilling, brutal, angular strokes. 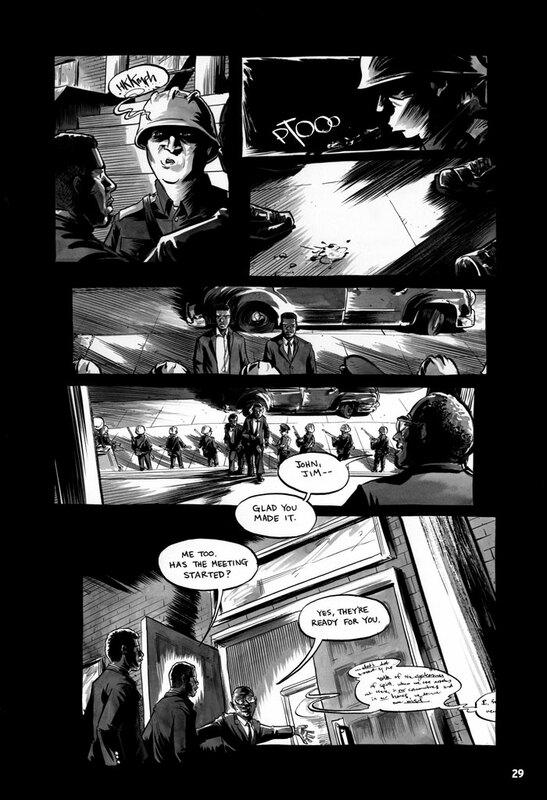 There are beautiful wide-angle shots establishing historic locations, and sharp, angular, lines along with extensive use of black and white color juxtapositions to relate Lewis’ personal turmoil and the drama of these famous and infamous events. 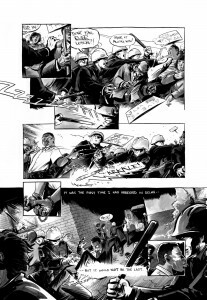 Lewis, Aydin, and Powell relay the story in visual and verbal metaphors that are breathtaking. 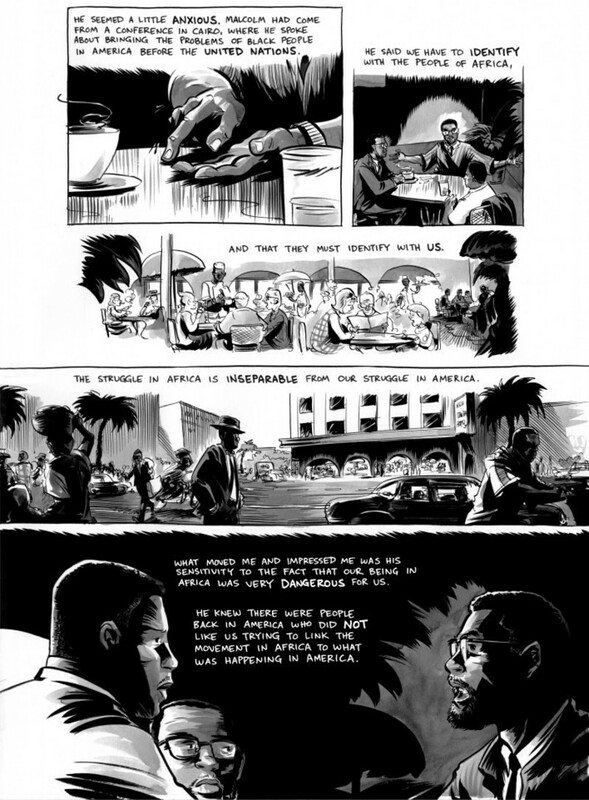 What makes this book and this series so outstanding is that while Lewis tells his side of the Civil Rights Movement, he modestly downplays his own role as we learn that the real heroes were those who sacrificed their personal goals, their time, and often their lives to advancing equal rights for all. As a result we feel like we are there with them, looking on, urging them forward. Regardless of whether we’re in 2017 or the heat of the 1960’s, Lewis continues to tell his story in his engaging first-person narrative – either from his eyewitness accounts or through his recollections of where he was when critical events unfolded. 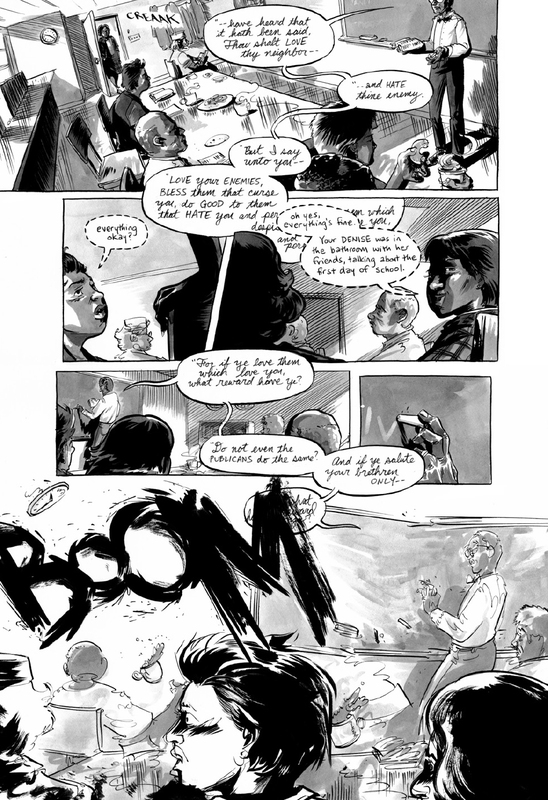 As Lewis’ life unfolds in March: Book Three, we learn about the tragic bombing of the 16th Street Baptist Church on September 15, 1963, during which four young girls were murdered. Fear gripped Birmingham as riots erupted, resulting in even more tragic deaths. 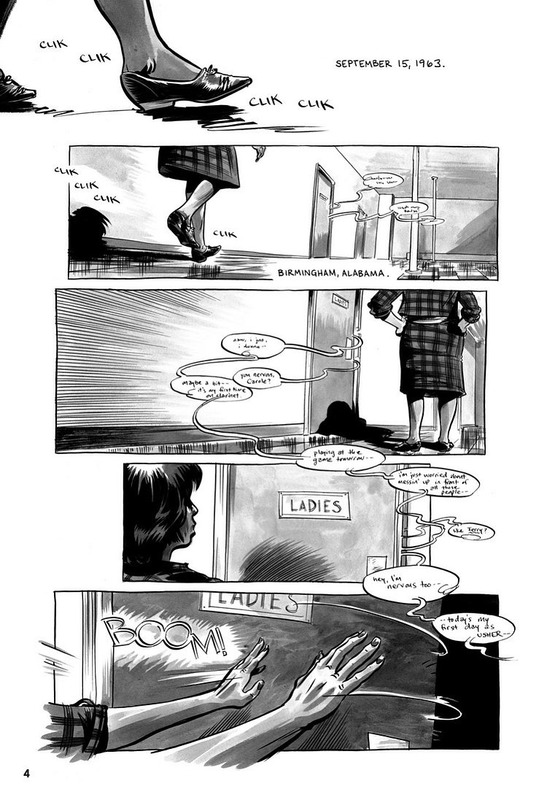 Following the bombing and the funerals, we learn that Diane Nash and Lewis met with Dr. King to present a plan. Their “Action in Montgomery” proposed they recruit a nonviolent army to “pour into the capital city” in the hopes of shutting it down until the following objectives were met: force Governor George Wallace out of office and allow every adult in Alabama a vote. We learn that while Dr. King didn’t approve of the plan, the SNCC still went ahead to register Black voters in Selma (Alabama). This resistance, along with multiple arrests and violence from the hands of Alabama State Troopers (incited by Sheriff Clark), meant the task of voter registration became quite difficult. The project, however, continued to expand. It expanded to the State of Mississippi, it expanded to mock elections to help teach African-Americans how to register and vote, and it expanded to the Freedom Vote movement. Tragically, three volunteers were murdered as they traveled from their training — murders that Neshoba County officials denied for a long time. Lewis’ story takes us from the establishment of the MFDP to the role it played in the Republican and Democratic National Conventions. More specifically, to its role in trying to have its own delegates admitted to the Democratic National Convention, as Alabama refused to allow them a voice (let alone votes). At the convention, we learn of Joe Rauh’s role in helping the MFDP, and his having various testimonies of people like Fannie Lou Hamer (who’d been beaten previously for her attempt to gain the vote) aired on national television — with the hopes of adding continued pressure on Johnson and Humphrey — the Democratic candidates for President and Vice President. 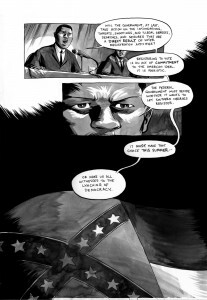 The remainder of the book recounts the pivotal events at the Democratic National Convention, and the roles played by leaders such as President Johnson, Dr. King, Malcolm X and others, all leading to Johnson’s signing the 1965 Voting Rights Act on August 6, 1965. The SNCC established a volunteer training program where White and Black volunteers were trained on how to get Black voters to register. This was done during “Freedom Summer.” Their goal was to set up Freedom Schools in local churches and community centers and to register voters on mock polling lists. In April 1963, the Mississippi Freedom Democratic Party (MFDP) was officially created. In short, Lewis’ story is told through gentle narration and vibrant art in a way that empowers us to relive it with him. As a result, readers better understand the social unrest of 1960s, the trials and tribulations of brave Black and White Americans who offered their time and many their lives for the Civil Rights Movement, and the torturous route that had to be taken to secure the rights of every American adult to vote. The choices and objectives the characters made and how each one influenced their paths. What was gained and what was lost? What were the costs to states/cities/individuals? What were the pivotal decisions made that helped shape the changing political and social landscapes? Different ways people (newspapers, magazines, personal accounts) reacted and reported major civil rights incidents, marches, deaths, etc. President Johnson at the death of President Kennedy, at the Democratic National Convention, and upon signing the 1965 Voting Rights Act. Discuss how his views, policies, and convictions changed or didn’t change. Mickey Schwerner (and his surviving wife Rita), Andy Goodman, and James Chaney — the three Freedom Vote volunteers murdered in Neshoba County. Jim Clark, Sheriff of Dallas County, Alabama. The 1964 Republican and Democratic Conventions. Analyze how the book’s different characters dealt with racism. Ask students how they might deal with racist comments, practices and restrictions. Discuss different options and means of protest. How have these options changed today compared to the options Lewis and his colleagues had in the 1960s? Discuss the different instances of discrimination and racism presented throughout the book. Discuss instances of racism today on local, national, and international scenes. How is it the same/different across time and geographic locations (nationally and/or internationally)? How, has racism changed today, if at all? Discuss how hurtful racism can be to those targeted as well as to the general population. Discuss how racism has influenced, shaped, and determined national and international policies and politics. Discuss what can be done today to fight racism and discrimination and ways students can help. Analyze and discuss the urgency to develop Black leadership and the problems they faced in doing that. Why the rights for all adult voters were so critical to the Civil Rights Movement as well as for this country in general. Why was there so much opposition? Search for, define, and discuss the book’s use idioms, hyperbole and simile to better express opinions, feelings and cultural expressions. Discuss how effective they are in communicating a specific message or a specific point in time. Compare and contrast the language used in the various speeches given by President Johnson from the time he took office at the death of President Kennedy to his announcement of the 1965 Voter Rights Act. How did his tone and words change? You may have students write two versions of these stories as a means of reflecting on language use and idioms that are time/era specific. Have them write first-person narrative as if they are in the 1960s; and then have them write about the era in reflection. How do the language and/or the story differ? Would someone today say this — why or why not? Discuss “Will they think that liberalism is dead when the man is dead?” Who are “they” and what are the meanings and ramifications of this statement? On page 54, we read that President Johnson “…moved quickly on his promise to pass a civil rights bill. Unfortunately, that meant pressuring many civil rights groups, the SNCC included, to halt our protests and demonstrations — He felt our actions were making it harder for him to win votes in congress. We strongly disagreed.” Have students debate both sides. 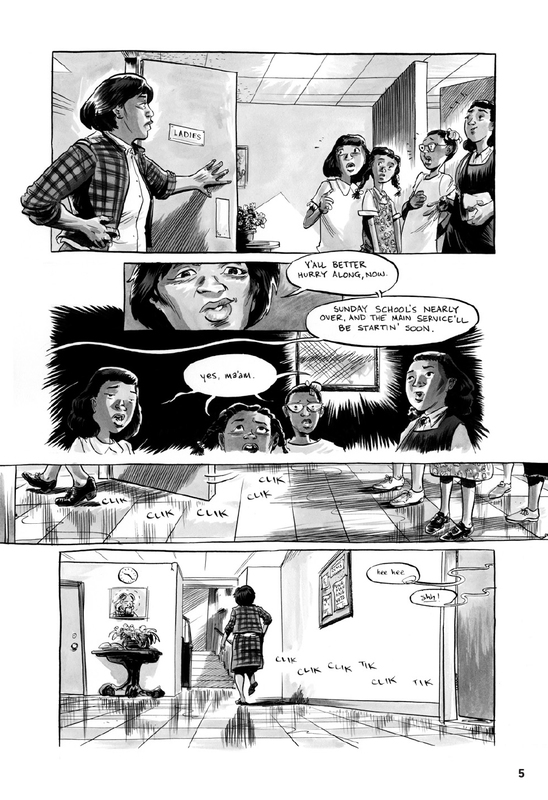 On page 118 Fannie Lou Hamer is watching recaps of her testimony earlier that day at the Democratic National Convention and she notes to her companions, “That’s why I like that song “Go Tell It On the Mountain…’ I feel like I’m talking to the world.” Discuss what she meant by this. Discuss the power of song to move people and to shape movements and policy. On page 124 Lewis notes, “To me the 1964 Democratic Convention was the turning point in the [Civil Rights] Movement.” Discuss and debate what he meant and why he may have felt this way. Do you and your students agree? Why / why not? 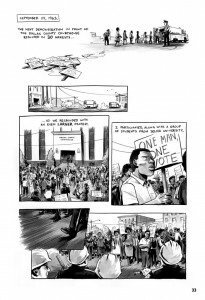 Have students hunt for examples of how Aydin and Powell use text, image and design to relay complicated messages and issues, or simply present your own instances and have students analyze them. Discuss how seemingly effortlessly the transitions are made between past and present. Analyze how this is done. Compare and contrast the depiction of violence (for example on pages 7-10; 12-13; 34-35; 40; 94-95; 151-157; 164-165; 200-205). Analyze and discuss the visual metaphor on page 79. They are concerned about three missing Freedom Vote volunteers. We read the text, “We felt so powerless… a small band set out to search…” while we see someone searching in the dark with a flashlight, a mosquito biting hi then him killing the mosquito before continuing with his search, shining a flashlight on a patch of grass. Discuss your reactions to this image — both immediate reactions and subsequent reactions after closer looks. Discuss the intent of these two pages. Discuss what makes this image and its message so powerful. Analyze and discuss the top panel on page 121. The text notes that, “Meanwhile, Johnson’s people were working in back channels… to erode our support on the credentials committee [at the Democratic National Convention]…” This text, however, is juxtaposed on a black background with an image of an old phone with phone cords twisted and locked around dialogue balloons from their various conversations. Kingby Ho Che Anderson (Fantagraphics, 1993; reprint edition 2010): a beautifully illustrated award-winning biography integrates interviews, narrative, sketches, illustrations, photographs and collages that pieces together an honest look at the life, times, tragedies, and triumphs of Martin Luther King Jr. For King, Anderson won Harvey Awards for Best New Talent (1991); Best Graphic Album (1993); and Parents’ Choice Award (1995). The Silence of Our Friends by Mark Long, Jim Demonakos, and Nate Powell (First Second Books, 2012): a semi-autobiographical story of Mark Long’s childhood experiences in Houston, Texas, during 1968 and centering around the Texas Southern University student boycott after the Student Nonviolent Coordinating Committee (SNCCC) was banned from its campus. P.S. Be Eleven (winner of the Loretta Scott King Award, 2013) and sequel to One Crazy Summer (Newbery Honor Book) by Rita Williams-Garcia: addressing race, gender, and political issues of the late 1960s. Martin’s Big Words: The Life of Dr. Martin Luther King Jr. by Doreen Rappaport and Bryan Collier (illustrator): an extraordinary picture-book biography incorporating narrative, famous quotes from Dr. King, and powerful collage and watercolor illustrations introducing King’s words and legacy to younger readers. Research to Build and Present Knowledge: Conduct short as well as more sustained research projects based of focused questions, demonstrating understanding of the subject under investigation; gather relevant information from multiple print and digital sources, assess the credibility and accuracy of teach source, and integrate the information while avoiding plagiarism; draw evidence from literary or informational texts to support analysis, reflection, and research. Presentation of knowledge and ideas: Present information, findings, and supporting evidence such that listeners can follow the line of reasoning and the organization; adapt speech to a variety of contexts and communicative tasks, demonstrating command of formal English when indicated or appropriate. https://snccdigital.org/inside-sncc/alliances-relationships/mfdp/ — From the SNCC digital collection: “Mississippi Freedom Democratic Party (MFDP) – photos and background information. 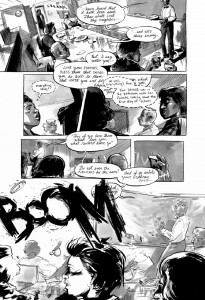 http://www.jsums.edu/hamerinstitute/resources/flhspeeches/ — A Voice That Could Stir an Army: Fannie Lou Hamer and the Rhetoric of the Black Freedom Movement – has various texts and speeches made my Fannie Lou Hamer. These are in text format and some video/recorded speeches. http://www.pbs.org/wgbh/americanexperience/films/freedomsummer/ — PBS.org American Experience: Freedom Summer – has a brief synopsis of the Mississippi Freedom Summer initiative; Clips “An Integrated Party” about the Democratic National Convention; “Three Missing Workers”; “The Risk” discussing the risks volunteers took in Mississippi that summer; “Fannie Lou Hamer’s Testimony”, about the testimony before the Democratic Credentials Committee and President Johnson’s impromptu press conference to get her off the air; “How Many Beatings Have you Taken?” Fannie Lou Hamer’s testimony before Mississippi Democrats; “The Eulogy” Dave Dennis’ eulogy at the funeral of James Chaney, one of the three Freedom Vote volunteers killed in the summer of 1964; “Searching for the Bodies” )”I think it’s a hoax but If they dead I think they asked fo’ it”… one White woman says; “Pete Seeger and Freedom Summer”; and much more. 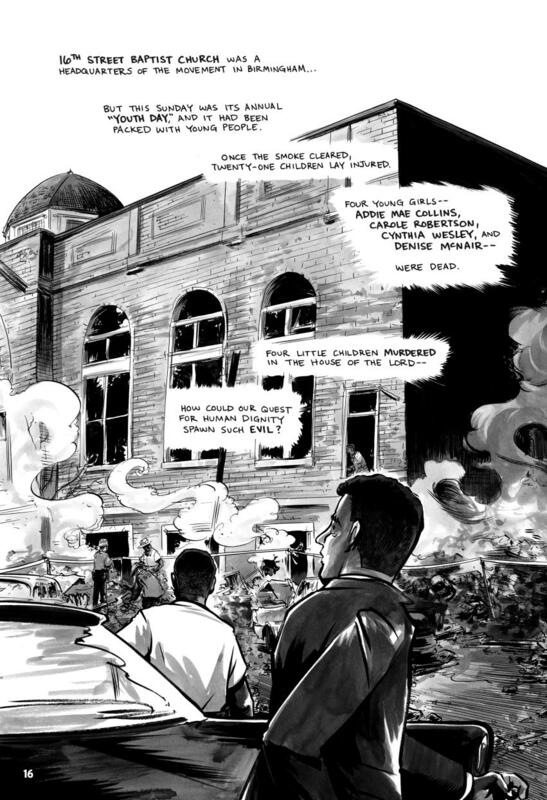 http://www.jofreeman.com/photos/mfdp64.html — The Civil Rights Vigil at the 1964 Democratic Convention – includes a discussion of that event and photographs including the one of the burnt out car that had carried the three murdered Freedom Vote volunteers. http://www.vogue.com/article/celebrating-fannie-lou-hamer-1964-dnc — celebrating Fannie Lou Hamer, Heroine of the 1964 Democratic National Convention. PBS’ American Experience: Civil Rights Movement Non-Violent Protests — contains related videos, photographs, interviews, press coverage and primary sources, milestones, reflections, notes for teachers, and more. Historical places of the Civil Rights Movement – We Shall Overcome: A National Register of Historic Places Travel Itinerary with an introduction, itinerary maps, list of sites and links to learn more. 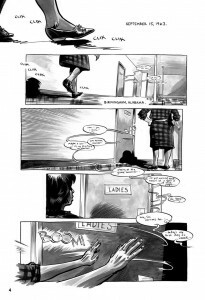 http://www.academicinfo.net/africanamcr.html — civil rights history resource. Notes and brochures of the SCLC’s Crusade for Citizenship found now at the King Center. http://www.goodreads.com/shelf/show/civil-rights-movement and http://www.slj.com/2013/01/books-media/collection-development/focus-on-collection-development/civil-rights-everyday-heroes-focus-on-january-2013/ — provides extensive lists for further reading on the Civil Rights Movement for students of varying ages and reading levels. All images (c) John Lewis, Andrew Aydin, and Nate Powell.